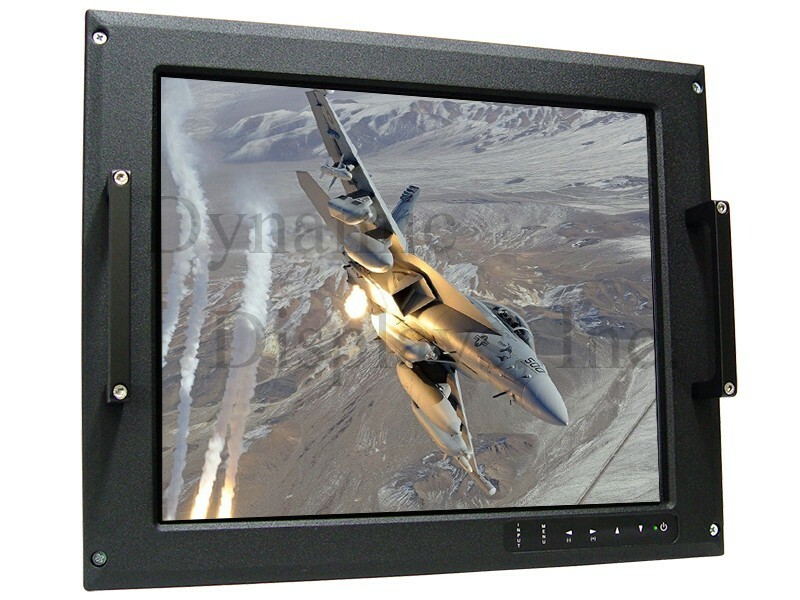 Dynamic Displays’ MRD-1817 Series COTS 17″ Military Rugged Displays include shock and vibration safeguards and provisions for extreme temperature and high moisture operation as well as EMI protection for use in extremely harsh weather conditions found in Military Applications. Target application platforms for the MRD-1817 Series COTS LCD Monitors include: fixed-wing aircraft, helicopters, surface ships, submarines, ground vehicles, and mobile shelters. Dynamic Displays' MRD-series Military Rugged Displays are designed with shock and vibration safeguards, provisions for extreme temperature operation, high moisture safeguards, as well as Electromagnetic Environmental Interference protection for use in extremely harsh weather conditions found in many Military Applications. The MRD1817 is a 17” cost-effective military-grade LCD Display, packaged in a rugged panel mount enclosure. This monitor is designed for use in demanding applications that require graphics, video, and other RGB data on a single, rugged display. Target application platforms for the MRD-1817 Series COTS LCD Monitors include fixed-wing aircraft, helicopters, surface ships, submarines, ground vehicles, and mobile shelters. Though rugged enough for most Land-based and Shipboard Applications, the MRD-1817 17” rugged LCD is versatile, as well. With provisions for 3 / 4 / 5 Wire BNC Inputs and RS170 / RS343 Video Operation, the MRD-1817 COTS LCD Monitors allow for easy insertion into legacy technologies and lower obsolescence risks. Target application platforms for the MRD-1817 Series COTS LCD Monitors include: fixed-wing aircraft, helicopters, surface ships, submarines, ground vehicles, and mobile shelters. 17.0 In SXGA TFT LCD Display with Solid State LED Backlight. 1280 x 1024 Native Resolution. High Bright TFT Display: 1200 Nits. Wide Viewing Angle: 85R/85L – 80U/80L. Bonded Anti-Glare Protective Faceplate Glass for Superior Optical Performance and Enhance Protection on Extreme Environments. Analog RGB Sync On Green (SOG), Composite Sync or Separate Sync Inputs (5 BNC). RS-170 (525 Line) & RS-343 (875-Line) Interlace Formats. 90-264VAC Auto Ranging Internal AC Power Supply. Aspect Ratio: 1:1 or 4:3 (OSD Selection). Front Manual Full Range Brightness and Contrast Control (Dimming). Extended Operating Temperature Rating: -30°C to +85°C. Conformal Coating of Internal Assemblies for Enhanced Ruggedness. Heavy Duty Aluminum Front Bezel. NEMA 4/12 & IP65 Front Panel. Designed Engineered and Built to comply with MIL-STD-810. Custom Designs Available; Including Spec, Color, Finish and Format. NVIS Class A & B.
NTSC/PAL Composite Video (RCA Jack) and S-Video (4 Pin Mini-Din). 3 Buffered Unity-Gain BNC Outputs (RGB). Differential Video Input for Enhanced Noise Immunity. Touch Screen: Resistive, Capacitive, and SAW.